Merry Go Round – Trees & Flowers & Birds! It’s a tree ornament AND a state of life! Another old classic, though not as old as the mouse. This one has been around ever since we started using white lights in a tree – which I think is pretty much when my parents bought the first fake tree we owned and my mom and I perfected the art of “wrapping” the branches with over a 1000 lights. Yeah, really. It was pretty obnoxious – and very very bright! This ornament is almost more entertaining in the daylight. What you do is remove one light from a strand and plug in the merry go round instead. And then, it spins. Hence the slight blurring of the black horse. The mirrored bottom and top accents reflect the lights all around it. But, when positioned properly on the side of the tree nearest a window that gets direct sunlight at certain points of the day…it also catches THAT reflection and then bounces light all around the surrounding wall. 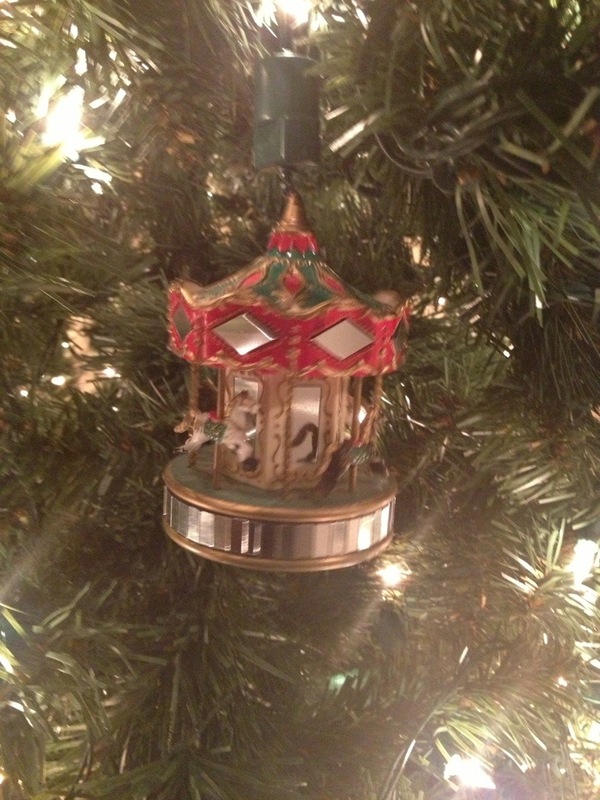 Given that the ornament is at least 25+ years old, I am quite impressed that it is still going strong! Me this week? Not so much 😦 Started out feeling a bounce back from the cold and other stuff on Monday & Tuesday. Even baked a batch of chocolate cookies to follow up on the first jello spritz batch. But then the whole car sharing with 27 got a little complicated this week and started weighing on me Wednesday. As did the news that my dad had chest pains and was in the hospital. That meant spending Thursday with my mom while we waited for those tests though still with lingering transportation issues covering 27’s work day. He got a ride into work at the last minute, but I still had to muddle through worse than ever evening traffic to pick him up after a long day of sitting around. Thankfully my dad is OK. Nothing major to fix or surgery needed. Just some new medications he should take to help his heart work more efficiently. It’s not working at 100%, but after bypass surgery and at his age, they don’t expect it to do that. It’s a relief that nothing more invasive than the tests had to be done, that’s for sure! But yeah, it was a long, out of sorts week and I was very happy to know that today I could have a ‘normal’ day and have my car the whole time.